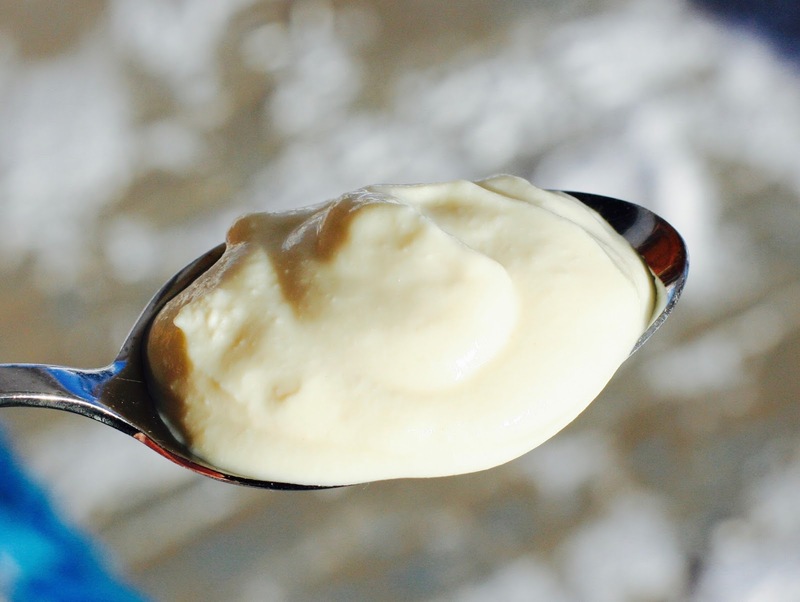 This recipe is a mashup of the two yogurt recipes Miyoko Schinner has given us in Artisan Vegan Cheese and Homemade Vegan Pantry. I like the thickness of the soy yogurt recipe, but I prefer the taste of almond milk so this recipe is the best of both worlds. A purely soy yogurt will set beautifully on its own without the aid of the cornstarch or agar, but I find it to be rather temperamental. If the yogurt gets too hot it will separate. Here, the starch and agar help set the almond milk whilst keeping the final product homogeneous. Perfectly thick yogurt every time. NOTE 1: this recipe makes a lot (but with four kids it does not last long). Half the recipe if needed, but also note that it will keep in the fridge for about 2 weeks. NOTE 2: Start this recipe by using a commercially available yogurt as your starter (you can use a dried yogurt culture, but usually they contain skim milk powder). For the next time you make yogurt, save 6 tbsp of yogurt from this recipe. The first batch might taste a little weird (depending on the quality of the yogurt you bought--they are all pretty horrible around here) but by your second batch and beyond you won't taste it anymore. 1. Blend the soaked cashews with the 2 cups of the almond milk. If you have a super blender like a Vitamix, you don't need to soak the cashews. Blend until smooth. 2. Whisk the cornstarch and agar into the 4 cups of soy milk in a saucepan. Add the cashew mixture and place over medium heat. 3. Heat the mixture, stirring constantly, until slightly thickened and glossy. You won't need to bring it to a boil (about 180 F), but it will be hot and steaming. You will notice the mixture getting glossier and sticking to the bottom of the pot a bit as you stir. It's going to take a good 15 minutes. 4. Remove from heat and let cool to 110 degrees Fahrenheit. Stir occasionally to prevent a skin from forming. When mixture is cooled, whisk in yogurt. 5. Pour boiling water into a large container with a lid to sterilize. Pour out water before adding yogurt. I use a massive 6 cup mason jar. 6. Pour yogurt into sterilized container and put on the lid. The trick now is to keep the jar warm (at around 110 degrees F) for the next 8-15 hours. I wrap my mason jars in a bunch of towels and leave it near the heater. In the summer, I leave it out in the sun. The longer you leave the yogurt, the more it will set and the tangier it will get.